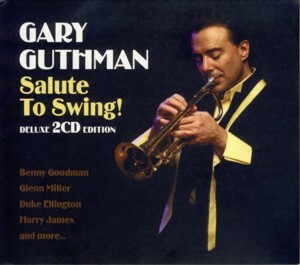 GARY GUTHMAN ~ SALUTE TO SWING! This is a compiled reissue of two albums by the American (resident in Warsaw) trumpeter / composer / arranger Gary GuthmanFind albums by this artist. The albums, recorded and initially released in Canada, are: "Sing, Sing, SingFind albums with this title" from 2005 and "Love TalkFind albums with this title" from 1999. Guthman leads professional Big Bands and is responsible for most of the arrangements, as well as for writing three original pieces on "Love Talk". The rest of the music comprises of well known Swing standards. As the title suggests, the music is a loving tribute to the Swing period in America, which lasted for over two decades between 1930s and early 1950s. The music was mostly played by a plethora of Big Bands and Jazz Orchestras, led by such celebrated composers / bandleaders as Benny GoodmanFind albums by this artist, Duke EllingtonFind albums by this artist, Harry JamesFind albums by this artist, Glen MillerFind albums by this artist, Count BasieFind albums by this artist, Woody HermanFind albums by this artist, Tommy DorseyFind albums by this artist and numerous others. Although considered as one of the Jazz genres and certainly playing an important role in the development of the idiom, Swing was also a form of popular music and at its peak "the" popular music in the US and to some extent worldwide. Based on solid melodies, many of which became Jazz standards, Swing definitely also included and encouraged improvisation, although limited to relatively short and strictly melodic, but often masterly constructed and incredibly cleverly executed solos. Guthman is not only a great trumpet player, but first and foremost an incredibly sensitive musician in the broadest meaning of the word. He writes absolutely brilliant music, which sounds instantly as good as any Jazz standard from the "fake book", but he is also able to compose contemporary Classical music or entire musicals. He has a pair of great ears, which makes him a skillful arranger able to make the most of any setting, from a quartet to a Big Band or an Orchestra. And he is also a great person, a perfect Gentlemen and a Friend! The two albums presented here are very dissimilar, which makes this compilation even more attractive that it originally appears to be. "Sing, Sing, Sing" is a straightforward tribute to Swing, featuring all the big Swing "hits" that many people are familiar with, without even knowing what Swing means. As such it is a perfect trip down the memory lane for elderly people like yours truly, who still remember their parents dancing while these melodies were being played on the bandstand or on the radio. Guthman delivers several scorching trumpet solos and the music swings like there is no tomorrow. "Love Talk" is a completely different story. It is an exquisite showcase of Jazz arrangement, kept within the general Swing aura, but superbly orchestrated, with the full power of an Orchestra, featuring lush string layers, which is on the whole a piece of elegant, masterly woven musical delight. Guthman´s trumpet playing on this album is much softer, lyrical and Jazz oriented. Overall this album presents the charm and splendor of Swing for everybody. Less experienced listeners will enjoy the evergreens on the first album, which is basically quite danceable, while connoisseurs will delight in the seductive enticement and sophistication of the second album in this set, which is much more suitable for the intimacy a bedroom than the swish of a dancing floor. Since nobody makes music like this anymore, I am not surprised by the fact that this album was so warmly embraced by the listeners. It is after all a piece of musical history, which is still fondly remembered. Way to go, my Friend!